Percent shale was computed from facies-distribution maps (Budnik and Smith, 1982) of the Lower and Upper Pennsylvanian-age rocks, respectively. The main assumption we made here was that the Granite Wash included only shale and coarser grained clastics but no bedded carbonates. This is, of course, not strictly true, but Dutton (1982a) did present several figures that imply relatively minor amounts of carbonate interbedded with the Granite Wash. 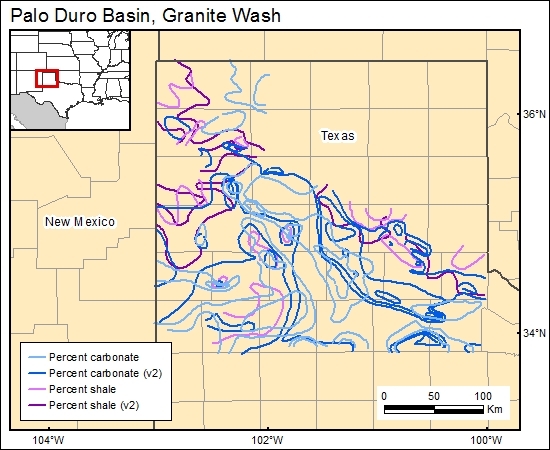 Therefore, this map can more correctly be called "percent shale and carbonate." Budnik, R., and Smith, D., 1982, Regional stratigraphic framework of the Texas Panhandle, in Gustavson, T. C., Bassett, R. L., Budnik, R., Finley, R., Goldstein, A. G., McGowen, J. H., Roedder, E., Ruppel, S. C., Baumgardner, R. W., Jr., Bentley, M. E., Dutton, S. P., Fogg, G. E., Hovorka, S. D., McGookey, D. A., Ramondetta, P. J., Simpkins, W. W., Smith, D., Smith, D. A., Duncan, E. A., Griffin, J. A., Merritt, R. M., and Naiman, E. R., Geology and geohydrology of the Palo Duro Basin, Texas Panhandle: a report on the progress of the nuclear waste isolation feasibility studies, 1981: The University of Texas at Austin, Bureau of Economic Geology, Geological Circular 82-7, p. 38-86. Dutton, S. P., 1982a, Depositional history and reservoir quality of Granite Wash, in Gustavson, T. C., Bassett, R. L., Budnik, R., Finley, R., Goldstein, A. G., McGowen, J. H., Roedder, E., Ruppel, S. C., Baumgardner, R. W., Jr., Bentley, M. E., Dutton, S. P., Fogg, G. E., Hovorka, S. D., McGookey, D. A., Ramondetta, P. J., Simpkins, W. W., Smith, D., Smith, D. A., Duncan, E. A., Griffin, J. A., Merritt, R. M., and Naiman, E. R., Geology and geohydrology of the Palo Duro Basin, Texas Panhandle: a report on the progress of the nuclear waste isolation feasibility studies, 1981: The University of Texas at Austin, Bureau of Economic Geology, Geological Circular 82-7, p. 87-90.